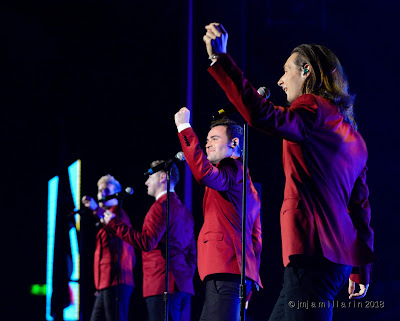 COLLABRO - The UK-based musical theater group recently held their concert for the leg of their Asian tour last February 26 held at the Newport Performing Arts Theater in Pasay City. Composed of Jamie Lambert, Michael Auger, Matt Pagan and Thomas Redgrave, they took the stage of “Britain’s Got Talent” for an audition and eventually won the competition in 2014. When I found out that they were here in the Philippines for a concert, I was looking forward to watch them live. I’ve seen their audition videos on Youtube three years ago and fell in love with them ever since. The show started a bit late because the traffic in Manila caused problems to the people to get to the show on time. The organizers then decided to push the show back to accommodate the “late comers”. The concert started with the Singing Sensations, Resorts World Manila’s very own “Dream Girls” as the front act. Composed of Charlotte, Jasmine, and Cris, this sultry and talented female group rock the stage with their hot performance. I must say that these girls are talented and their world-class performance is impressive. Now here comes the most awaited part of the show. Collabro started their performance with “This is the Moment” from the musical “Jekyll & Hyde”. It was then followed by Disney classics and some famous songs from famous Broadway Musicals that we love like “Les Miserables” and “Phantom of the Opera”. Their repertoire also includes Beauty and the Beast, Send in the Clown, Journey to the Past, Empty Chairs and tables, Bring Me Home, I dreamed a dream, Music of the Night, Frank Sinatra Classics, Come What May, Defying Gravity, Stars and their first original song Light House. I got goosebumps with their empowering rendition of Music of the Night. I started to recall scenes from the Phantom of the Opera when we watched the musical back in 2012 at the Cultural Center of the Philippines. Too bad, my husband was not able to join me in the concert, if he was with me, I am sure he will be delighted. He is a real fan. I am also super in love with their cover of “Bring Me Home”. With just the first line of the song brought back that Jean Valjean's death scene with Fantine and Éponine. Whenever I think of Collabro, I think of Broadway. The group is also a huge fan of Les Miserables, that is why a song from that famous musical was always included in their album. But you don’t need to like Broadway musicals for you to love Collabro. Aside from being good looking, seeing them performing on stage will make your heart flutter. Their heavenly music offers a feast for the ears. I also had the chance to be with them after the concert. The After Party which was held at El Calle Bar – Resorts World Manila gave me the opportunity to have a photo op and dinner with them. It was an amazing evening indeed!